It’s been a long road to glory for pasta in Atlanta. Without the large Italian population that blessed other American cities, we never had a community to teach us how to revere fragrant bowls of noodles. Spaghetti was a generic meal we boiled, tossed with jarred tomato sauce, and likely spiked with a cheese-like substance we shook from a green can. Or it equaled a gourmet endeavor involving mounds of flour, egg yolks, and an intimidating metal machine with a crank handle—too much bother for most of us. Last decade’s low-carb fad diets, Atkins and South Beach and their ilk, nearly killed our appetite for pasta altogether. It took the recent recession—driving us back to comfort foods—to remind us how satisfying, almost healing, a twirl of al dente tagliatelle can be. Our few long-running Italian restaurants—La Grotta and Sotto Sotto among them—did teach us some basics: Anoint pasta with sauce rather than drown it. Pair fresh pastas with delicate flavors and dried versions with heartier ingredients. Use thicker strands for cream sauces and ragus, and spiral shapes like fusilli to ensnare pesto. Floataway Cafe introduced us to the Cal-Ital approach to pasta, with minimal saucing but lively combinations like Georgia white shrimp tossed among ropy bucatini with chiles and parsley. In 2008 La Pietra Cucina imported the bombastic flavors of Mario Batali’s New York empire: Its opening chef, Bruce Logue, briefly worked at Batali’s flagship, Babbo, and cooked pungent numbers like chitarra (a thick noodle) with mussels and capers in a tomato broth. Two years ago, Michael Patrick started Storico Fresco, a company specializing in obscure, regional Italian pasta recipes like turtej cu la cua, shaped to resemble a leaf and filled with ricotta, mascarpone, and greens like stinging nettle and Swiss chard. He eventually began experimenting with authentic recipes made of flours derived from grains (kamut, an ancient kin to wheat), pulses (fava beans), and nuts (hazelnuts). Though Patrick comes at his craft from a purist’s standpoint, his unusual products sparked the imaginations of local chefs. 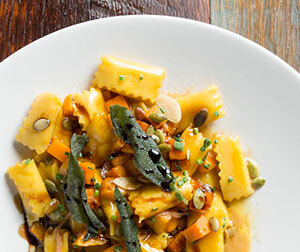 In the last year, housemade pasta has become de rigueur on the menus of our best restaurants. We’ve finally left carbophobia behind; our cooks are recognizing that pastas make sublime foundations for seasonal vegetables and a gamut of meats. These six creations, a delectable mix of the traditional and the unorthodox, warm the stomach and engage the mind.